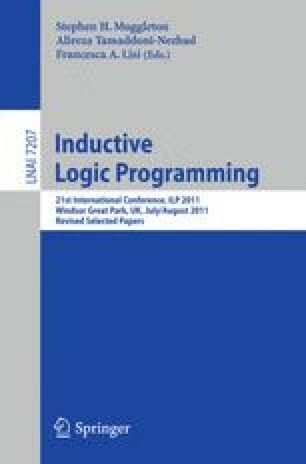 There is a growing interest in the field of Probabilistic Inductive Logic Programming, which uses languages that integrate logic programming and probability. Many of these languages are based on the distribution semantics and recently various authors have proposed systems for learning the parameters (PRISM, LeProbLog, LFI-ProbLog and EMBLEM) or both the structure and the parameters (SEM-CP-logic) of these languages. EMBLEM for example uses an Expectation Maximization approach in which the expectations are computed on Binary Decision Diagrams. In this paper we present the algorithm SLIPCASE for “Structure LearnIng of ProbabilistiC logic progrAmS with Em over bdds”. It performs a beam search in the space of the language of Logic Programs with Annotated Disjunctions (LPAD) using the log likelihood of the data as the guiding heuristics. To estimate the log likelihood of theory refinements it performs a limited number of Expectation Maximization iterations of EMBLEM. SLIPCASE has been tested on three real world datasets and compared with SEM-CP-logic and Learning using Structural Motifs, an algorithm for Markov Logic Networks. The results show that SLIPCASE achieves higher areas under the precision-recall and ROC curves and is more scalable.